Kim Kardashian and Kanye West, who celebrated their nuptials in Paris, France, and Florence, Italy, with family and friends last week, are currently celebrating with a honeymoon at Castle Oliver in the south part of County Limerick in Ireland, Us Weekly reports. 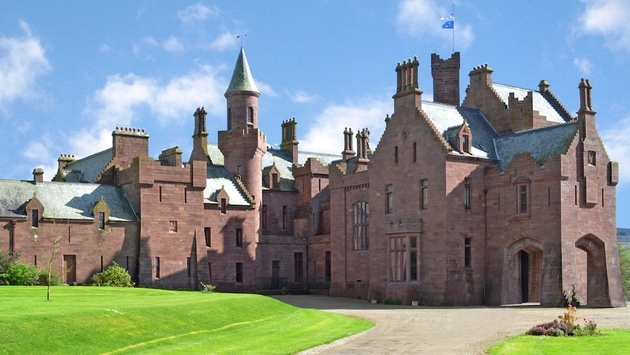 Castle Oliver is rather fitting for Kim and Kanye. They enjoyed a pre-wedding brunch at Valentino's castle, Chateau de Wideville, and also hosted their rehearsal dinner at the Palace of Versailles. Castle Oliver is one of Ireland's largest private homes. Located near the village of Ardpatrick, the estate has several master suites, a ballroom, lush surrounding gardens, a lake, and dramatic scenery of the Ballyhoura mountains. The castle, which was built in 1843 with local red sand stone, is located just two hours from Dublin. Kim and Kanye are celebrating their honeymoon without baby North, who left Paris with grandmother Kris Jenner on Sunday, May 25, following the wedding. The couple is also expected to be in Prague this weekend for the wedding of Kanye's stylist, Renelou Padora. What do you think? Is Castle Oliver fitting for Kim and Kanye?